Need more information about booking Home 163874 ? This is perfect for couples wishing to stay in a ground floor holiday apartment that has a quiet private garden and a large outdoor swimming pool. The accommodation has everything you need to make yourselves at home. A variety of shops, restaurants and amenities are within walking distance from the apartment. The residential village is a short 30 minute drive from Larnaca Airport, two miles from the Mediterranean sea and a ten minute drive to the lovely Ayia Thekla sandy beach. Whether you are visiting Cyprus for the first time or visiting friends and family in the area, you can feel rest assured that this apartment will feel like home from home. There is a comfortable leather sofa in the diner. You can help yourselves to a film to watch or a book to read during your stay. The 32" flat-screen television on the wall is connected to a variety of satellite channels. You will notice that some of the wall sockets have USB sockets which will enable you to easily power your personal electronic devices. Xylophagou is a large residential and quiet village located two minutes off the A3 motorway. This motorway links to other towns and villages between the large town of Larnaca and the holiday resort of Ayia Napa. There is a convenient discount supermarket situated less than 1 km from the apartment. This supermarket stocks the usual grocery and household items that you would expect to find in your own local supermarket. There are several kiosks within the village where you can purchase everyday essential items. Xylophagou boasts a 24 hour bakery, cake shops, a post office, petrol stations, pharmacies, churches, independent shops, a bank and an off licence. There is free wi-fi internet available in the bars and restaurants within the village. Feel free to read the excellent reviews guests have posted on TripAdvisor. Guests have expressed their gratitude that the apartment is lovely, quiet and has everything that you need for your stay. They have been impressed with the comfort and cleanliness of the apartment. Please can you wash all bed linen and towels and hang these out to dry inside the apartment on the clothes horse before your departure. 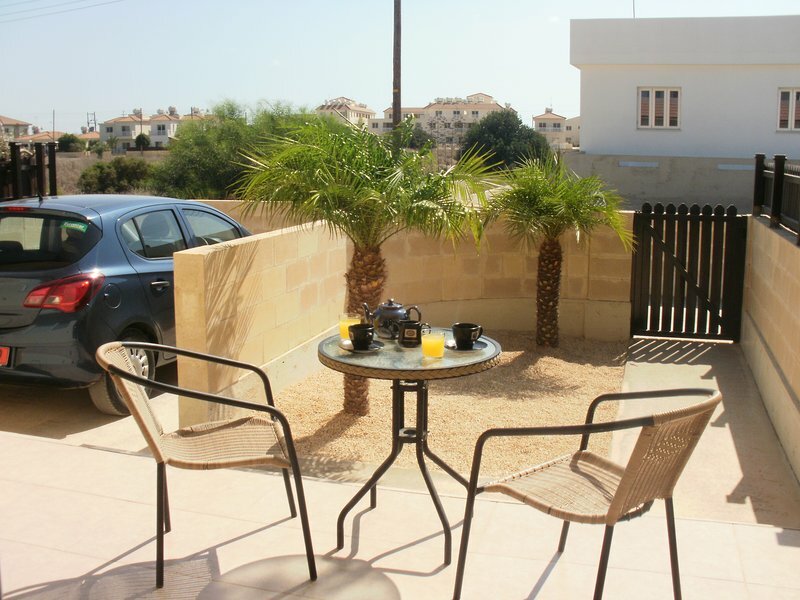 The apartment is close to Ayia Thekla beach and the popular tourist destination of Ayia Napa. Guests have commented about the good range of amenities on offer in the village including shops, bakeries and restaurants. The apartment has been described as being good value for money. You are welcome to contact me with any queries and I would be more than happy to help. Please kindly note that I do not offer a discount for stays of less than three weeks since the rental rate is already great value for money. The apartment does normally get fully booked during the summer months and you are advised to book ahead if you would like to stay during this high season. There is a fully refundable damage deposit taken at the time of booking and this is returned to you on your departure. The apartment is just a 30 minute drive from Larnaca International Airport and a 2 hour journey from Paphos International Airport. Several airlines fly daily to both airports from European countries including especially England. The average flight time from London is 4½ hours with major airlines that fly to Cyprus. As the apartment is located in a residential village, car hire is strongly advised and this would enable you to explore the island of Cyprus at your own leisure. I can email you easy to understand instructions on how to access the apartment and answer any questions that you may have. Please note that the apartment sleeps two people. Smoking is strictly prohibited at the apartment. The apartment is not suited to party goers and they would be advised to look for alternative accommodation in Ayia Napa. If you wish to bring one small child with you, please contact me with more information and a decision would be made. Our 4th stay at this property, actions speak louder than words in my book. This fabulous little property has everything you need and more. Adam has done even more improvements this year making the apartment feel very welcoming and homely. There really is nothing I would change. Great communication as always, and a great apartment. This is the second time we have stayed at the really lovely well maintained apartment. Everything you need for a comfortable stay is provided. You are close to all amenities in the village but far enough away for a lovely quiet vacation. The beautiful beach of Agia Thekla is just a couple of miles away and if it's night life you want Agia Napa is approximately 7 miles away. Relax in Style. Admire the Palm Trees!